What are the new nutrition standards for school lunches that have some students boycotting their cafeterias and discarding the food? Indeed, some 31 million American kids participating in the federally supported National School Lunch Program have been getting more whole grains, beans, fruits and vegetables in their diets—whether they like it or not. The change is due to new school meal standards unveiled by the U.S. Department of Agriculture (USDA) last January, per the order of 2010’s Healthy, Hunger-Free Kids Act. The new standards are based on the Institute of Medicine’s science-based recommendations and are the first upgrade to nutritional standards for school meals since 1995 when low- and no-fat foods were all the rage. The new standards limit calories per meal to 850 for high school meals, 700 for middle school and 650 for elementary and more than double the mandated minimum servings of fruits and vegetables while reducing the sodium, saturated fats and trans fats in school kids’ diets. 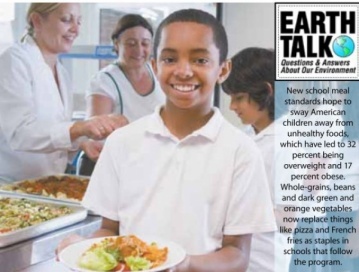 Whole-grain foods, beans and dark green and orange vegetables such as broccoli, spinach, carrots and sweet potatoes have replaced things like pizza and French fries as staple items in schools that follow the program. Of course, not everybody likes the changes. Lunch strikes, Facebook protest pages, Twitter campaigns, YouTube parody videos and other means have been utilized coast-to coast to voice opposition to the healthier meals. Some affected cafeterias blame the new smaller portions and healthier fare for causing as much as a 70 percent drop-off in school lunch program participation since the new standards took effect. The benefits of the new standards far outweigh the costs. “School meals can help children develop healthy eating habits—or they can prime them for a life of poor health and unnecessary suffering,” says EWG. EWG lauds the new standards for significantly expanding access to and appreciation of nourishing food. Whether they can help shift eating norms across the country remains to be seen, but regardless millions of American kids will likely now get their healthiest meals of the day on a tray in their school cafeterias. EWG, www.ewg.org; National School Lunch Program, www.fns.usda.gov/cnd/lunch/; Healthy, Hunger-Free Kids Act of 2010, www.fns.usda.gov/cnd/ governance/legislation/ cnr_2010.htm. earthtalk@emagazine.com. Subscribe: www.emagazine.com/ subscribe. Free Trial Issue: www.emagazine.com/trial.